New to the First Coast is True Food Kitchen, a national chain with 25 restaurants across the country. Situated across from Capital Grille, True Food Kitchen is not your average healthy food spot with fast casual service. In fact, it’s a table service and cloth napkin kind of place with a full bar. They operate under a philosophy that food should make you feel good, and that you don’t have to sacrifice “delectable dining” for “conscious nutrition” (their words). True Food Kitchen not only offers healthy food, but makes dining with most food restrictions or allergies pretty easy. 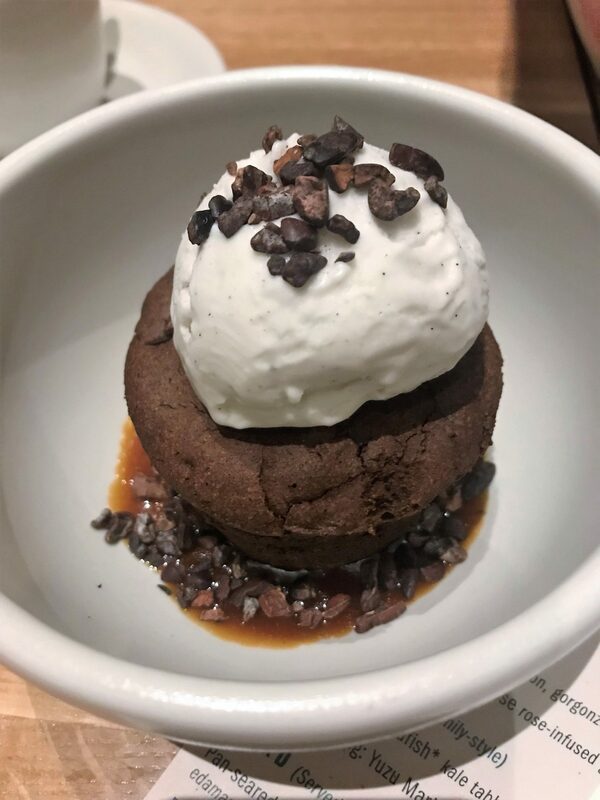 Vegan, vegetarian, gluten free, dairy free, and more diet constraints are no big deal at True Food Kitchen, where many dishes naturally fall into these categories. There are noodle and grain bowls, pizzas, salads, sandwiches, and entrees, with menus changing seasonally as different ingredients come into season. 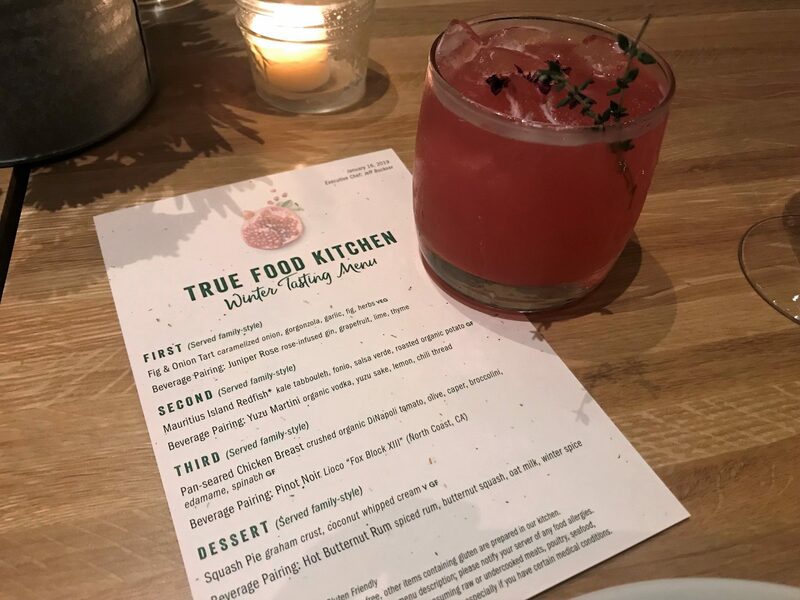 True Food Kitchen invited us to try their Winter Menu, which just launched the second week of January and will be available until April when the spring menu will launch. 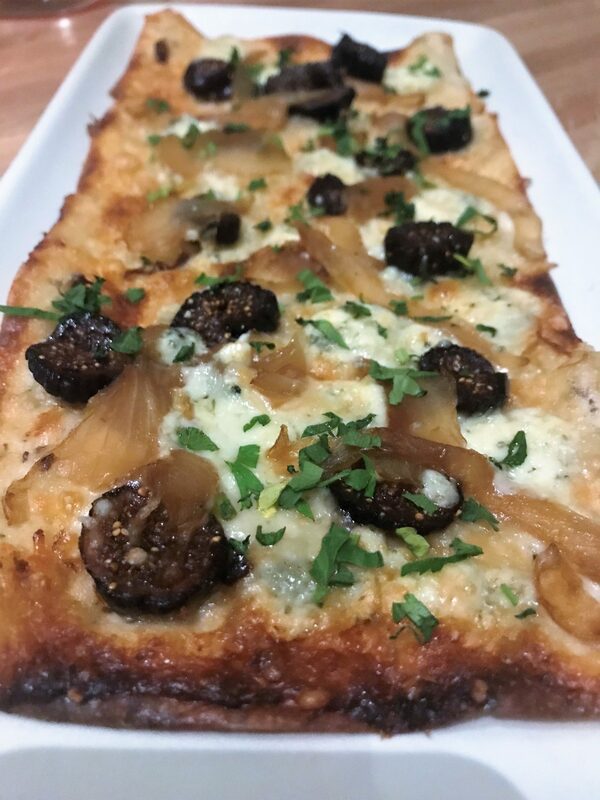 We started with the Fig & Onion Tart (carmelized onion, gorgonzola, garlic, fig, herbs, $10) paired with the Juniper Rose (rose-infused gin, grapefruit, lime, thyme, $12). This cocktail was not only light and fresh, but absolutely gorgeous. The rose infusion was subtle, so it didn’t taste like you were drinking flowers. Gin tends to divide people into those who love it and those who can’t stand it, but the gin in this cocktail wasn’t in your face. The fig and onion tart sounded incredible, but we found it underwhelming. These ingredients should all go together, but the garlic just didn’t work for us. It was more intense than any other flavor and overpowered the figs. 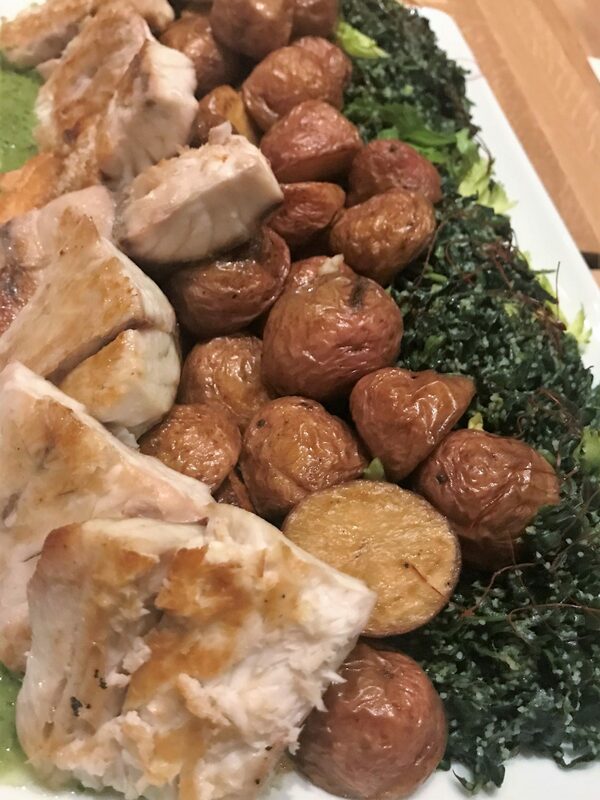 The second pairing was the Mauritius Island Redfish (kale tabbouleh, fonio, salsa verde, roasted organic potato, $25) with a Yuzu Martini (organic vodka, yuzu sake, lemon, chili thread, $13). I’m a sucker for redfish. It’s a mild fish with a medium texture, so it has a light taste, but doesn’t fall apart as easily as other mild tasting fish. The kale tabbouleh was excellent. I don’t personally care much for kale, mostly due to the tough texture, but that was completely taken care of with the finely chopped nature of the tabbouleh. The potatoes were roasted perfectly with crisp outer edges and soft middles. This was an enjoyable dish. 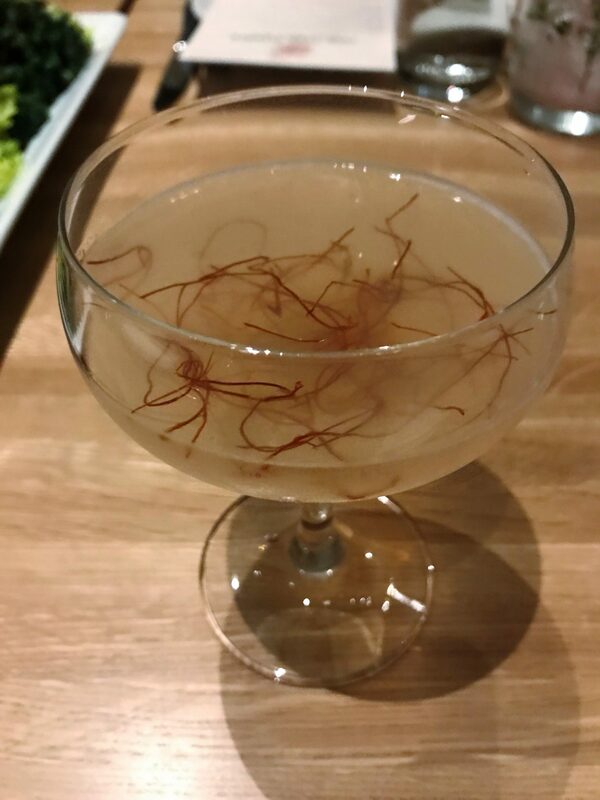 The yuzu martini had a mellow citrus taste with a little heat from the chili threads. The threads made it hard to drink as they kept trying to go in my mouth while I was drinking, then would attach themselves to my lips. I ended up scooping the threads out after a few sips, but you could also eat them. If you leave them sit in the drink they will add more heat, which some may enjoy. 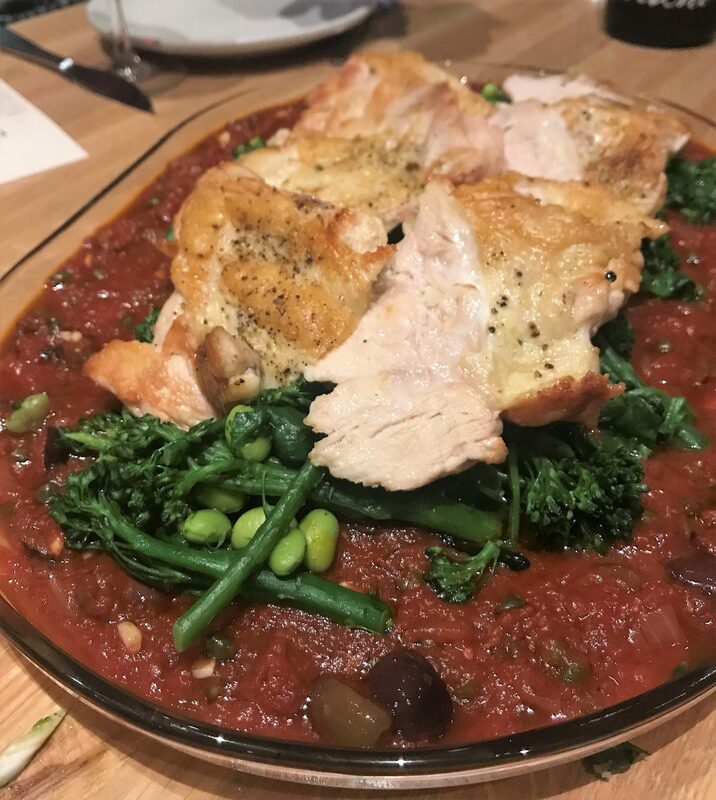 The third pairing was Pan-Seared Chicken Breast (crushed organic DiNapoli tomato, olive, caper, broccolini, edamame, spinach, $20) and a Pinot Noir (“Fox Block XIII”, North Coast, CA, $15/glass). The wine was delectable. It was very fruit heavy with cherry. I don’t drink a lot of red wine, but this went down easy, and it didn’t give me a headache. Maybe it was all the liquor I had before the wine acting as a prophylactic pain reliever, or maybe it was just excellent wine. The pan-seared chicken breast was a hit around the table. The puttanesca with the olives and capers had layers of flavor that we kept enjoying as we chewed. The broccolini, edamame, and spinach seemed to almost melt right into the puttanesca in each bite. This chicken was perfectly tender and flavorful. Often Italian cuisine can be heavy, but this felt romantic and also light enough to act on those romantic feelings after the meal. 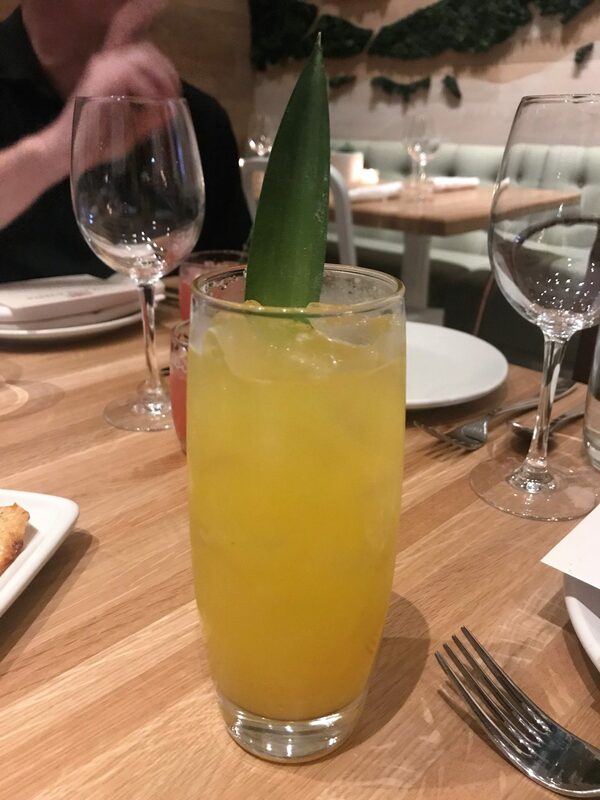 The puttanesca was our favorite of everything we ate and drank at True Food Kitchen. If you love olives you will be madly and deeply in love with this dish. If you hate olives then shoot for something else on the menu. For dessert we had a mini version of the Squash Pie (graham crust, coconut whipped cream, $9) and the Hot Buttered Rum cocktail (spiced rum, butternut squash, oat milk, winter spice, $11). I feel like squash pie is not the most enticing name, but this pie was quite a charmer. It was somewhere in the ballpark of pumpkin or sweet potato pie, but the crust was hearty and the filling was smooth. It’s actually completely vegan and gluten free, but tastes rich and indulgent. 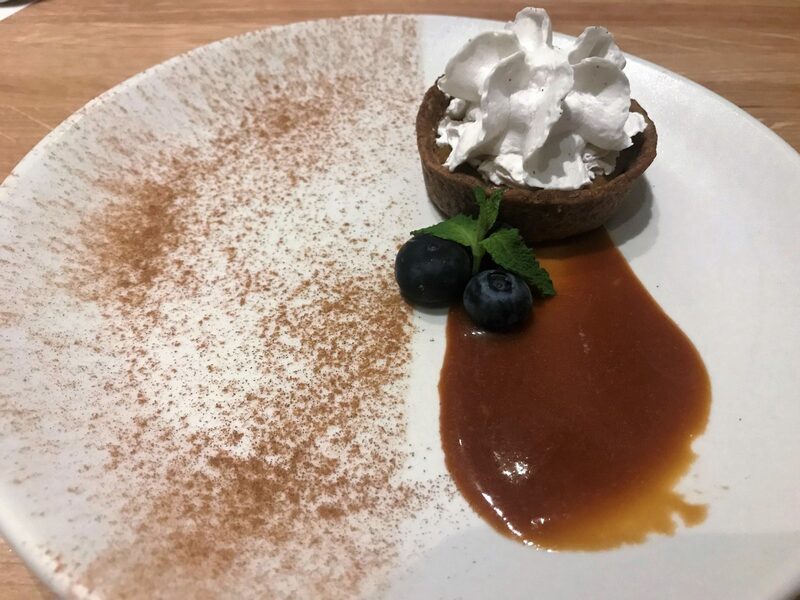 There was a vegan caramel sauce on the plate that we loved. 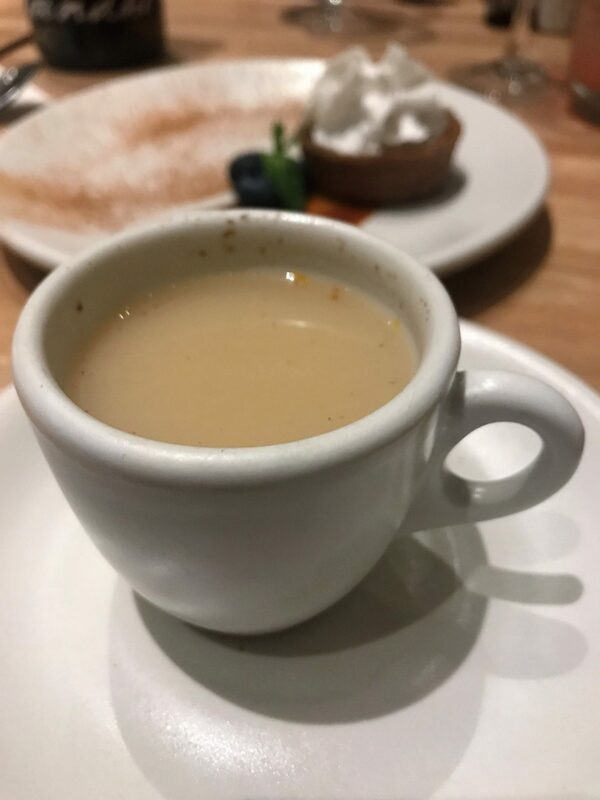 The Hot Buttered Rum was the kind of hot toddy that will fix all that ails you. It is strong and it will warm the cockles of your heart. Overall, True Food Kitchen is doing creative things with seasonal ingredients. This is not your average healthy food eatery. 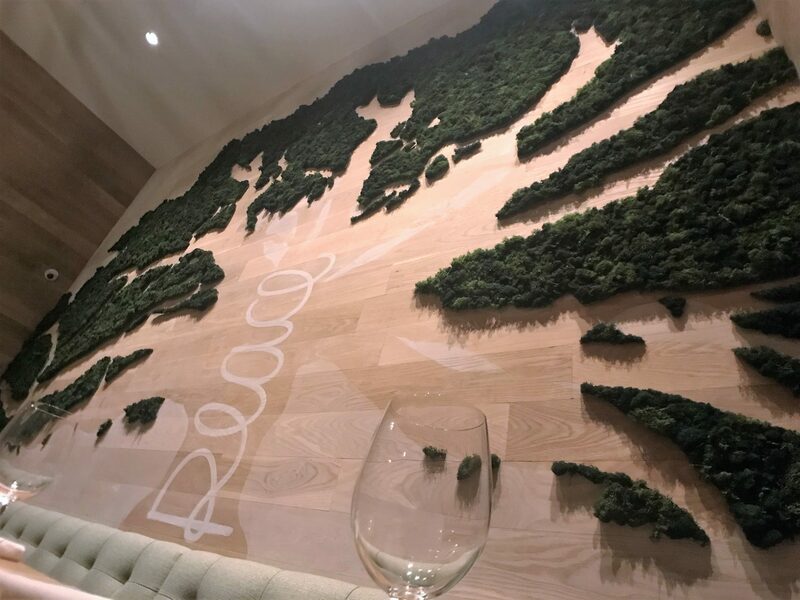 It is elevated dining for conscious eaters. It is slightly pricier than Jacksonville diners are used to, but its neighbors are Capital Grille, J. Alexander’s, and Cantina Laredo, all of which are on the higher end in Jax for what they offer. So True Food Kitchen fits their neighborhood. You won’t find regular sodas or processed/refined ingredients on the menu, but by striking those from the kitchen, True Food Kitchen creates a whole new world of food on offer that makes you feel as good it as it tastes. Tagged Alcohol Serving, Casual, Date Night, Dinner, fine dining, Full Bar, Gluten-Free Friendly, healthy options, lunch, St Johns Town Center, vegan friendly. Bookmark the permalink.